Many of us have been following the massively high levels of radiation on the West Coast of America, following the earthquake and tsunami of 2011, which crippled the Fukushima nuclear plant in Japan, leading to multiple meltdowns and hundreds of tons of radioactive contaminated water being dumped into the Pacific Ocean, daily. 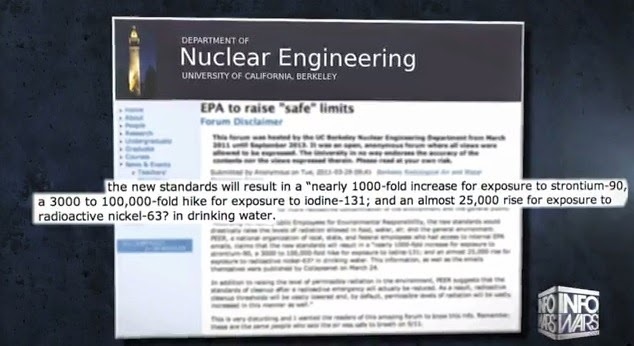 In the video below, Alex Jones details efforts made to force the hand of the US government in monitoring these levels, leading to an arbitrary change into what was named as officially “safe” levels, and the report below highlights the cover up that has been underway, not just by the Japanese government but by governments along the West Coast as well. Second video is a reminder of the radiation levels across the US from the related article linked above.